Columbus Blue Jackets – 41 wins, 89 points. This season, Todd Richards and his Blue Jackets squad, currently hold the second wild card spot in the East and would be the Bruins current first-round playoff opponent if the season ended tonight. Looking at their roster, there are a few recognizable names; the biggest one being old friend Nathan Horton, who signed in Columbus after off-season shoulder surgery. One name you might not recognize, Ryan Johansen, has turned the 2013-14 season into his coming out party. The fourth overall pick back in 2010 has finally delivered what the Blue Jackets had hoped for when they drafted him. His 32 goals and 59 points lead the team, followed by Artem Anisimov’s 21 goals, and Cam Atkinson’s 20. Last year’s Vezina Trophy winner, Sergei Bobrovsky, has come back down to Earth a little after his stellar season and 2 GAA last year. Bobrovsky owns 30 wins and 5 shutouts, good for third in the NHL. He’s a goaltender; however, he has mightily struggled in his seven playoff appearances, posting a GAA of 4.04 and an .848 save percentage. Ouch. Season Series: The Bruins swept all three games with Columbus, outscoring them 9-4. These two teams have not played since November 30th. Verdict: For many Bruins fans, including myself, playing Columbus is the ideal matchup. They are a fairly young team with only one previous postseason appearance in their history, only two or three offensive threats and a goaltender who has minimal playoff experience. The only concern here for me is if Horton rekindles some of his magic during the Cup run of 2011 to cause the Bruins fits. Still, if this matchup were to happen, Bobrovsky might be capable of stealing a game, but the Bruins would and probably should win this series with relative ease. The Big Bad Bruins and the Broad Street Bullies. This series is the least likely to happen of the three with Philadelphia currently occupying third in the Metropolitan Division, yet still has an outside chance if Columbus or Detroit win their last three games and Philadelphia has a couple of slip-ups. The Flyers started off very slow in the early going, resulting in Peter Laviolette losing his job. The renaissance under new coach Craig Berube has been noticeable, rising from the basement of the East to finishing the season comfortably perched in a playoff spot. Their top scorer, not surprisingly, is Claude Giroux. As captain, he has done well leading his team with his overall offensive game and toughness. His 27 goals and 81 points both lead the team, but his leadership is most important to a team looking to make a run this year. As for goaltending, Steve Mason would be their most likely playoff starter. This season, he has 33 wins with a 2.51 GAA and four shutouts. In the playoffs, much like Bobrovsky, Mason lacks experience. His only four playoff starts were all losses for the Blue Jackets in their only postseason appearance, when they were swept by the Red Wings. Small world, huh? Season Series: The Bruins swept all three meetings with Philadelphia this season, outscoring the Flyers 15-6 and scoring a minimum of four goals in each of their three matchups. Verdict: The Flyers and Bruins have been matched up many times in the playoffs, especially since the turn of the decade. A Bruins sweep in 2011 on their way to a Stanley Cup erased the painful memories of that Philly comeback in 2010. If a series between these two rivals were to happen in the first round, you can expect some black and blue, physical hockey. I would not mind a Bruins/Flyers series from a rivalry perspective. The intensity would be at its highest amongst the two fan bases, which is what the playoffs are all about. In terms of the series itself, this would be a middle ground. It would not be easy and go at least six games, but I would favor the Bruins. Detroit Red Wings – 38 wins, 90 points. The Red Wings, the newest addition to the Eastern Conference, is a team that could cause some problems in the first round in the playoffs for either Boston or Pittsburgh. Starting with the coach, Mike Babcock, who should garner some Jack Adams consideration after navigating around injuries to their two stars, is a Stanley Cup Champion AND lead the Canadian Olympic team to gold this past February. His playoff experience should not be overlooked. Their top scorer, Gustav Nyquist, who did not start the year on the Red Wings roster, has been on a tear the second half of the season. His 28 goals lead the team and his electrifying speed can give make any defense man in the NHL look stupid…ask Zdeno Chara. In net, Jimmy Howard has had a little bit of a rough go this year. He does have 21 wins, but his 11 overtime losses ranks number one among NHL goaltenders. Those may be good for a point in the regular season, but not in the playoffs. Unlike Bobrovsky with Columbus, Howard does have 42 games of postseason experience with Detroit, putting up a 20-22-2 record with a 2.57 GAA and a respectable .918 save percentage. Season Series: Out of the four potential playoff teams, the Red Wings have given the Bruins the most trouble this season. In four matchups, the Bruins have recorded one win, in their first meeting of the season way back in October. They have been outscored 13-9, including an embarrassing 6-1 defeat back in November. Verdict: For the neutral, this series would be great considering the Original Six roots of both of these clubs and great for the executives at NBC. As a Bruins fan, the Red Wings scare me. This team is capable of causing the Bruins big time problems on the back end, which is their greatest weakness entering the playoffs. 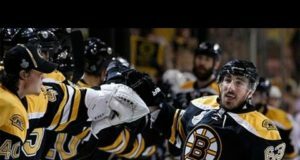 The Bruins do not match up well with speedy, skilled teams. The Red Wings are a skilled team with an experienced coach and a goaltender who has playoff experience, even though the record may be average. Even though I would favor the Bruins to win this series, the chance of an upset, although slim, is there. The Bruins advantage over all three of these teams, and perhaps any Eastern Conference opponent, is threefold: The Bruins can roll out four lines on a consistent basis, have the best third line in the NHL with the skill of the Swedes in Soderberg and Eriksson and the grit of Kelly, and, of course, Tuukka Rask. When you have the best goaltender in the NHL, that can take you to the NHL summit in two months time. Playoff time is right around the corner Bruins fans. Get a seat on the bandwagon and hold on tight. The emotional roller coaster is about to begin. Joe Marraccino is a guest blogger for Chowdaheadz and can be reached on Twitter@JoeCherry89.